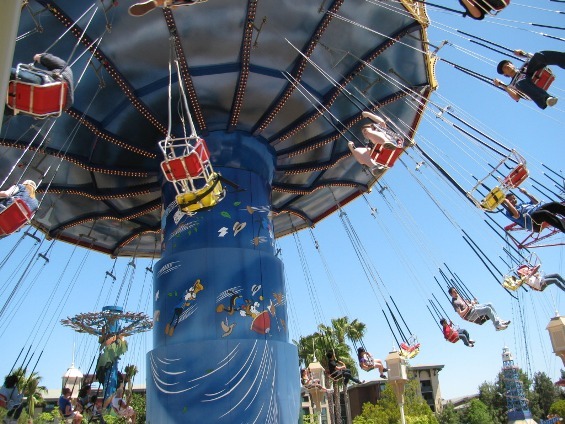 Silly Symphony Swings is Inspired by the classic 1935 Mickey Mouse cartoon short, “The Band Concert”. Guests board the swings for a leisurely ride serenaded by the band playing “The William Tell Overture” (aka The Lone Ranger Theme) conducted by Maestro Mickey. Everything seems fine until a tornado hits the orchestra and Donald Duck takes over (which can only mean trouble). There are currently 0 reviews for Silly Symphony Swings. Be The First To Review Silly Symphony Swings! Check out all of our Theme Parks Attractions and Strategies threads over on DISboards.com! You can also search for Silly Symphony Swings specific threads!